I dissabled Clique, assign keyboard keymaps and all is working! Create a new Mapped Key in the “Click Bar Healing Config” Key Map. Call this “Show Hide Healing Bars”. This mapped key is actually used to keep the Click Bars visible when switching characters. Set a Hotkey for this Mapped Key. I’ve used F10. Create a New Step for this Mapped Key so it has 2 steps. Main Healer Bar ON should be Window:Current not Window:All w/ Current? The previous section for Set Healing Bars on Switch, mean that as you switch to each slot, it will "read" the status of the healing bars, and ONLY show them on the active slot. This is because 1. it seems pointless to use them from another slot, and 2. if you were to videofx into the other windows, you can't set a source on the clickbars. For the most part, I expected you would only ever use them from the current active slot. Set this up on my two man in LOTRO and it works perfectly if I am on my minstrel. However, my guardian is the character I run as the main and when I mouseover and click the bars the heal does not go through to the healer. What am I doing wrong? The Targets here should be the appropriate ATG that will execute the action. E.g. in the Main Healing Bar, it should be MainHealer ("Group (all of):MainHealer" in the drop down), in Alt Healing Bar, it should be AltHealer, and in Buff Bar, it should be Buffer. Thank you that fixed it. Now I just have to figure out why follow isn't working and all run when I with the press of keyboard keys. While a different topic, disable broadcasting when trying to move about. Press your Follow Hotkey (ALT+F). It presses the variable keystroke. 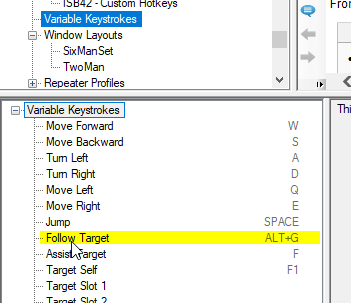 So, provided your in game keybind for Follow is set to ALT+G, it should work when you press ALT+F. Hello. I'm new to ISBoxer have been following this extremely well documented and laid out configuration guide. However, I am running into a couple of issues and have some questions. Earlier today, I think I almost had everything working. The mouseover overlay was working on the warrior. If I was mousing over the main healer buttons I watched the cleric target slot1 -slot 3 PCs. When mousing over the alt healing bars the shaman was changing targets as well. The first problem was that when I clicked key 1 or 2 while moused over the warrior is that not only was the cleric casting a hot the warrior was trying to kick. The same thing was occurring when I clicked key 2 (cleric medium heal ; warrior taunt). I tried to fix it. Regretfully, my mucking around has now broken the click bars. They are no longer executing keystrokes on the cleric/shaman windows. The targetting is still working great, but I am unable to figure why nothing is executing and still don't know the answer to my original problem. Why keystrokes were being executed on not only the primary account (warrior), but also on the clerics. Please advise. Any comments or suggestions will be greatly appreciated. Update - I managed to get mapped keys to execute heals and no longer activating keys on the warrior. I set target to Window: All w/o Current. However, now I'm still having issues with both the cleric and shaman executing keystrokes when using a mapped key. 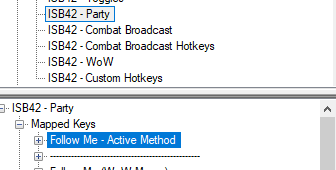 I have a HoT on hotkey bar slot 1 (cleric) and melee attack hotkey bar slot 1 (shaman) and both are getting pressed when I have the mouseover target as my warrior and pressing 1. Last edited by bob on Sat Jan 19, 2019 7:40 pm, edited 1 time in total. You don't really have any mapped keys setup for healing as far as I can tell. The Main/Alt/Buff key maps are pretty much empty. When you are pressing the 1 key, it is executing the mapped keys in ISB42 - Combat Broadcast Hotkeys. If you want to use Hotkeys to trigger things when moused over the bars, then you will need to setup some mapped keys to do something, and disable the keymaps which have the other mapped keys with hotkeys that you want to press. Or, you could hook up your new mapped keys to the actual buttons so you can click on them and they do something. I removed the default ISB42 keymaps that contained references to the number keys and exported to inner space. I'm still seeing the same thing. I really like the mouseover targetting provided by the heal bar, but still unable to execute a keystroke on 1 account only. On the Main Healing Bar I have 3 keys mapped (for testing) which is a HoT, Medium Heal, and CH and on the Alt Healing Bar I have a HoT and Medium Heal mapped. Basically what I'm looking for is to be able to target using the Click Bar then press a keystroke which is mapped to an in-game macro, but ensure that it does it on a specified account. Cleric heals executed when targetting using the Main Healing Bar and Shammy heals executed when targetting using the Alt Healing Bar. Will this solution work from what I'm trying to do or should I try something else? Sorry, my lack of knowledge when it comes to explaining this.